A Mommy's Adventures: stART ~ Just How Long Can A Long String Be?! 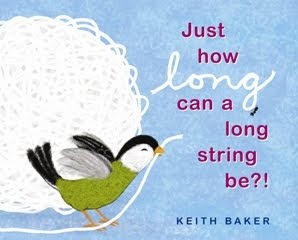 While we were at the library at the beginning of the week I found the book Just How Long Can A Long String Be?! , by Keith Baker on display. I read it and I had to take it home to share it with Emily. I was also so excited because I had the perfect project filed away to do along with this book!! I saw these in my August Family Fun magazine and knew I wanted to try them with Emily. This was a fun project for us to work on together. I cut 80 1 yard pieces of yarn before we started, however we used a smaller ball than in the magazine so I had a bit leftover. Emily covered the string in glue and I helped her squeeze off the extra. I used a whole 4 ounce bottle of glue. Emily and I covered half of a ball with the pieces of yarn. Emily realized it was more fun to pick the dried glue off of her fingers and I worked on covering the ball. Emily decided to put a piece on every once in a while...I think so she could get more glue on her fingers to pick off! Our almost finished bowl!! Now we just have to wait for it to dry. The magazine recommends letting it dry over night. Our yarn bowl is finally dried!! It actually came out really nice. It just took over 24 hours to dry. I think we will be trying this again one day with some smaller balls. Great idea! I haven't read that book yet. Neat idea. I haven't read that book either. We do a lot of book projects so I'll be sure to link up here next time we do one. Almost every book we read in my pre-k class has an art project to go along, and I always extend that to my own kids. 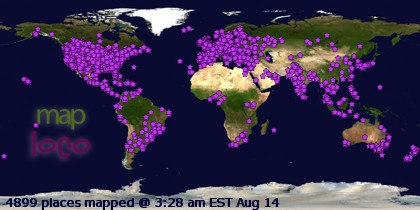 I'll come back for sure to post/link about our projects! I'll have one to link up next week, I can link up an activity from last week, if I get a chance to find it. And, I'm going to remember this for our nest theme in a few weeks. This looks great. I've thought about making them with the girls for along time but have never gotten around to it. start is a great idea! I hope to participate. What a great bowl! I've been thinking of making it w/ Lu! I love this! I want to make some of these for a Spring craft to display some cloth eggs in that we have! Yours looks great. That turned out great. I want to try that too. It looks intriguing. Probably more work that I'd be willing to put in, but fun. Thanks for the heads-up on a book too, I've never heard about it before. Did you have to do anything special to the ball so the yarn/glue wouldn't stick to it? This is really great!